I feel like it’s pretty hard for a letter game to distinguish itself at this point in the App Store’s life. Much like any long-in-the-tooth genre, new entries are starting to feel far more similar to each other than different. 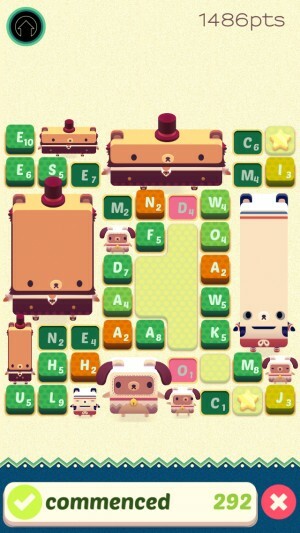 AlphaBear (Free), the latest from Triple Town (Free) developer Spry Fox, looks into the developer’s past for inspiration. Panda Poet is a web game that has you making words to create bigger and more numerous pandas than your opponent. It’s kind of a word game crossed with Othello, and if I may put on my day job hat for a second here, it’s been invaluable as an English study tool for some of the kids I teach. Though it works fine in mobile browsers, it’s not available as a native mobile app, and you really do need two human players to get the most out of it. In short, there’s room to grow the concept, and that’s sort of what AlphaBear does. To start things off, this is purely a solitary exercise. You don’t to worry about another player gumming up your plans. You’ll do a good enough job of that yourself, most likely. You’re still aiming to make the largest bears as you possibly can, though, and you’ll do that by clearing letters off of the board. Each tile cleared makes one bear, and adjacent bears will merge together into bigger and bigger bears. 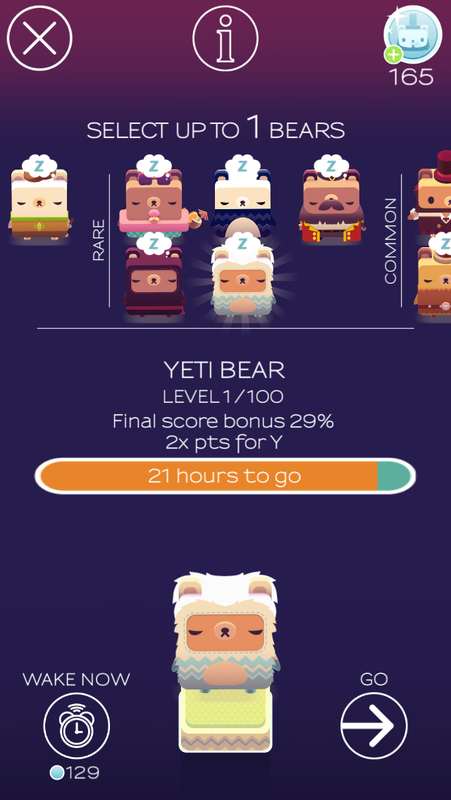 At the end of each stage, you’re awarded extra points based on the bears you’ve created, and these points are crucial for beating each stage’s score goal. Beyond the score goal, stages will sometimes have other twists to make things challenging. There are timed stages, stages where certain letters won’t appear, and so on. No matter what kind of stage you’re playing, the biggest threat to achieving your goal is when letters turn to stone. Each turn you take, the numbers on the tiles will count down by one. When they reach zero, that tile turns to stone, blocking bear expansion. This element discourages you from making too many small words, but it can also help you to catch words you might otherwise miss. Tiles are color-coded according to how many turns they have left before they turn, and tiles on their last turn will animate, making them stand out even more. You can see the letters you ought to use at a glance, which can sometimes give your brain a nudge in the right direction. As you clear tiles, more letters appear, until finally there aren’t any playable moves. Your score is tallied, and based on how well you do, you’ll receive a new bear for your collection. Bears are basically equippable buffs, giving you a bonus percentage on your final score, extra points for using certain letters, and so on, and you can level up those buffs by collecting multiples of the same bear. After using a bear, you’ll have to wait for a cooldown timer to count down before you can use them again. The more powerful the bear, the longer the cooldown. It’s a pretty cute idea, but it does result in a bit of a logjam in the middle sections of the game. Starting from around the third set of levels, it’s very difficult to clear the stage goal without bringing powerful bears in with you. The most powerful bears often have cooldowns of several hours or even a day, and you naturally won’t have too many of them at your disposal early on. This effectively results in having one or two good shots at each stage per session, after which you’ll need to wait for your bears to recharge. Since you can only advance through the sets by clearing the goals on a number of stages and beating the boss stage, it’s pretty frustrating to have to wait for a long time to get going again. You can still play the stages, but without strong bears, you’ll likely only be able to swing the lower goal, which isn’t exactly walking away with nothing, but doesn’t help you advance. This problem works itself out as you grow your collection of rare and legendary bears. This cooldown timer is one part of the game’s monetization structure. You can naturally wake bears up early if you’re willing to spend some bear coins. You can earn those at a fairly reasonable pace in-game, though not in the kind of quantities you would need to wake up rare or legendary bears regularly. You can also watch a video ad to get more, or just whip out your wallet. You can also use those coins to play special rounds where you have a chance of winning a legendary bear, which is probably the ideal way to spend them. Finally, you can use them to top off your honey meter. Honey is the game’s stamina meter, and each time you play a stage, you’ll consume a little. Time will bring it back, or you can just use some of your hard-earned currency to speed things along. The developers have included a $4.99 IAP to remove the honey mechanic entirely, and while the option is nice, honey isn’t nearly as much of a showstopper as the sleeping bears are. This is probably as good a time as any to mention that the game needs to do online check-ins constantly. The stages available to you are based on the time and day of the week, so I’m guessing that’s one of the reasons why. If you were hoping to play somewhere with spotty internet access, you’ll have to find a different game. AlphaBear also wants you to share on social media, but I’ll hand it to the game, it has a clever way of making it more fun than the usual spam that results from this kind of thing. When you unlock a new bear, it will say a couple of sentences with words that you spelled during that round mad-libbed in. The results are often hilarious, and even though I pretty much never do any sharing from within an app, I couldn’t resist here. This is more or less business as usual for a free to play game, though. In that context, nothing AlphaBear is doing is particularly naughty, but if you were looking to buy that honey IAP to change the game into a premium app, you’re probably better off keeping your money. The game is designed and balanced around being free-to-play, and the honey is only one small part of that. Taken on the terms it was presumably made under, it’s a very good game. The presentation is thoroughly adorable, the bears’ mad-libs make it a fun conversation piece, and the fundamental mechanics are challenging and enjoyable. As you get farther in the game, it’s very difficult to avoid turning some tiles to stone. The strategy then becomes which ones you’re willing to sacrifice in order to make the largest bear. That’s a layer of strategy we don’t typically see in a letter game, and I rather like it. It’s especially juicy during timed missions since you have to make those tough choices on the spot. 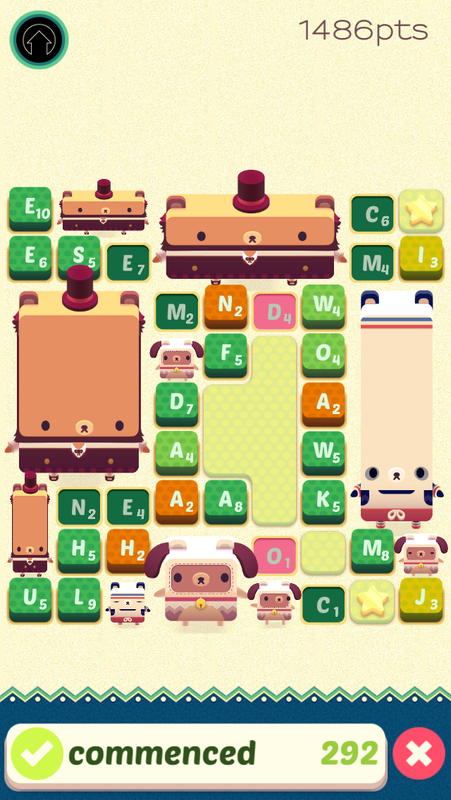 At its core, AlphaBear isn’t dramatically different from most other letter games, but between its few gameplay twists, the rewarding collection mechanic, and its infectiously silly and fun-loving nature, it’s an easy game to fall for. While I’m not totally happy with the power-up system, it’s still a remarkably generous example of a free-to-play game. Unless you’re turned off by the idea of playing another letter game, you don’t have much to lose by giving AlphaBear a try.